An Idaho reporter’s take on covering D.C.
You are here: Home / Communicator / 2016 / Fall 2016 / An Idaho reporter’s take on covering D.C.
Editor’s Note: Lewiston Tribune political reporter Bill Spence won the Idaho Press Club’s Don Watkins Mid-Career Scholarship this year, and used it to help offset some of the expenses of his 13-week reporting trip to the nation’s capital. In this article, he shares his experience. It seems like every time Sens. Jim Risch and Mike Crapo come to the Statehouse to address their former colleagues, they gush about how much better things are here in Idaho compared to Washington, D.C. I used to think this was just a line – something congressional pros tell the second-stringers back home to make them feel good. Then I spent three months covering Congress and found out Risch and Crapo are right. After watching the “pros” in action, I’m never complaining about the Idaho Legislature again. While the sojourn undermined my faith in government, it was certainly a fascinating experience. I’d encourage other reporters to take the plunge, as long as they can get their editors to spring for the rent. I first approached my boss five years ago about the possibility of going back to D.C.. The trip wasn’t in the budget that first time around, but when I raised the idea again last fall, he enthusiastically supported it. We agreed to a 13 week visit, from mid-April through the Fourth of July. The deal was the Tribune would pay my rent – $1,200 per month for a single room in a six-bedroom house within walking distance of the Capitol – while I’d pay for everything else. Press credentials – Media badges are handled through the Senate Press Gallery. It’s a very straightforward process. Short-timers can get a temporary day pass or, if you submit a letter from your editor saying you’re a real reporter and not just some gawker, you can get a spiffy photo ID badge. Work space – Whenever Congress was in session I would head to the Senate Press Gallery in the morning to grab a cubicle. It probably has space for at least 60 reporters; most cubicles are available first-come, first-serve. There’s also a soda machine, refrigerator and microwave, restrooms and five honest-to-god phone booths where you can have a little privacy and make free long-distance calls. Whenever you need a Zen moment, you can hear the sound of one senator talking to him or herself by stepping through a pair of swinging doors that lead directly to the press seats above the Senate floor. No photos or recording devices allowed – although if you want, you can stand there while the official Senate photo is being taken and be part of history. The House Press Gallery has a similar arrangement. Press credentials get you into either gallery, as well as the House and Senate office buildings and hearing rooms. Wifi is available throughout the complex. 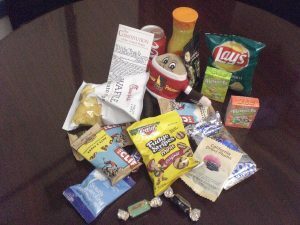 Hearings and press conferences – Say what you want about Congress, but they know how to cater to the media. Every committee room I was in had at least one table reserved for the press, if not two. I went to one hearing where eight large tables were set aside for reporters. I could count them because there were only three of us in the room. I was less impressed with House Speaker Paul Ryan’s weekly press conferences. They lasted 15 minutes and he only took questions from people he called on. Anyone who actually yelled out questions was scolded. The man has clearly not seen a single movie showing traditional press behavior. Keeping track of all the committee hearings and press events is easy: the House Press Gallery website has a daily list of all the House events, while the Senate Radio and Television Gallery does the same on the Senate side. When Sens. Risch and Crapo talk about how much better things are here in Idaho, I suspect they’re thinking about the way JFAC adopts the annual budget and appropriations bills, as well as the Legislature’s rules review process. I agree with them, but even more basic is the fact that Idaho lawmakers are clearly there to get a job done and go home. I never had that sense in Washington. In fact, the congressional schedule itself is a major impediment to institutional effectiveness. This year, for example, the House is only scheduled to be in session for 111 days, compared to 149 for the Senate. That’s actual work days, not including weekends. However, it also includes Mondays, Fridays and other partial work days, when members are traveling to or from their districts. Although some votes and/or committee hearings may take place, usually very little is accomplished on these days. When you exclude travel days, the House will be in session for 56 full days this year, compared to 87 for the Senate – and that assumes they don’t punt everything into next year and adjourn early. This clearly has a negative effect on productivity: Since convening in January of 2015, the 114th Congress has taken 580 significant votes and enacted 219 laws. It is on track to be the least productive Congress in at least the past 40 years. Even when members of Congress are at the office, they aren’t spending their time going to committee hearings or debating bills on the floor. I probably attended 50 hearings, and the only time more than half the members showed up was for the House Oversight hearing where FBI Director James Comey discussed the Hillary Clinton email scandal. That was political theater, when everyone wanted a seat in the room. For most hearings, though, they’re sending staff or dropping in for five minutes to ask a few questions. They aren’t actively engaging with the witnesses, much less with each other. It turns out members of Congress spend much of their day talking with constituents, special interest groups and lobbyists, going from one short meeting to another. After seeing their schedule and how they spend their time, I have no idea how they accomplish anything. Zika funding? Keeping guns out of the hands of terrorists? Fixing the budget process? How do they actually find time to build relationships and address the problems facing the nation? I asked one Washington lawmaker that and she told me – I’m not making this up – that the time she spends walking from her office to the House floor is a great time to talk with colleagues. This is how Congress solves problems: while riding tiny subway cars from one side of the street to the other. To be fair, she also told me meeting with colleagues during floor votes is also standard practice. That’s something else we don’t see in Idaho: mass conversations taking place while they’re passing legislation. It’s a sight to behold. I seriously believe you could have an appendix removed in the time it takes the Senate to finish a single roll-call vote. It lasts about a half-hour: The clerk calls the roll, maybe a quarter of the senators answer, then the vote is held open for another 20 minutes or so while members wander in and out talking with each other. Each one eventually gives the clerk a subtle thumbs up or thumbs down, she announces the final tally, and then they start all over again on the next bill. If anyone actually starts debating legislation, the rest run for the exits. I may be exaggerating a bit, but this is no exaggeration: If you find yourself losing faith in the Idaho Legislature, spend a little time in Washington. You’ll come home feeling like you’re back in the major leagues. 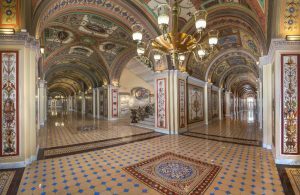 Brumidi corridors (courtesy of the Architect of the Capitol) – Besides Capitol protests, House sit-ins and Senate filibusters, one of the highlights of my DC trip was getting a private tour of the Brumidi Corridors with Vicki Risch and Senate Art Curator Amy Burton. Congressional swag (Bill Spence photo) – Most congressional offices provide some kind of home-state goodies for visitors to enjoy. A random walk through the offices can produce a pretty decent haul.